Type: EQUIPMENT. Detail: WOOD_BOARDS. Product Code: NSP45400. 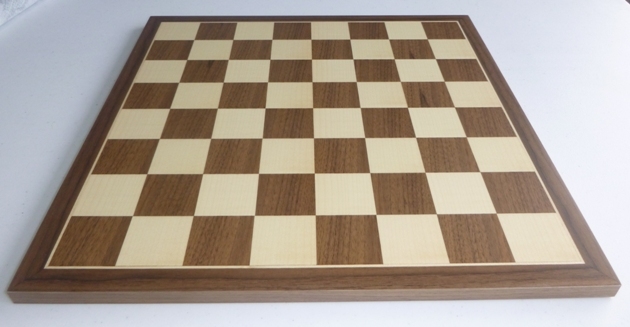 This wooden board is popular as a gift or a stylish way to play for the keen player.This is an elegant functional, wooden chess board, perfect for pieces with a king height of up to 8.5cm (3.35 inches) with a slim border, this board would be ideal in situations where space is an issue. 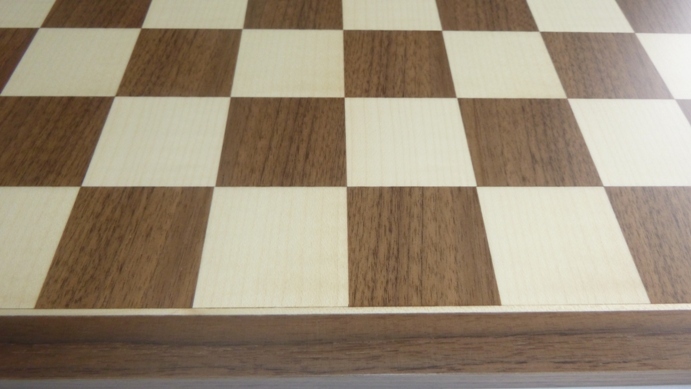 The square size is 45mm, total dimensions 400 mm by 400 mm, (15.7inches by 15.7) thickness 13mm, border 20mm.The dark squares are made of walnut while the white squares are created by using sycamore wood. The border is made from walnut and it has a mat finish.The boards are imported from a family firm in Spain who started their business in the 1950s. Chess Bag - drawstring. CHESS_BAGS. $3.50. Starting Out: Modern Benoni. . $27.95. The London System. 1 d4 OPENI. $29.95. Advanced Strategy DVD. . $20.00. Asian Seniors 2017. Asian Seni. $165.00.